Tamron has announced two new zoom lenses: a 10-24mm f/3.5-4.5 Di II VC HLD (Model B023) and SP 70-200mm f/2.8 Di VC USD G2 (Model A025), the latter of which is one of Tamron’s premium lenses, as evidenced by its “SP” designation. The new ultra-wide-angle zoom lens is designed for APS-C DSLR cameras and offers a 35mm equivalent focal length range of 16-37mm, which is the largest focal length range in its class (among ultra-wide angle zoom lenses for APS-C cameras as of January 2017, per Tamron). The lens is designed for street, landscape and everyday photography and succeeds the SP AF 10-24mm f/3.5-4.5 Di II LD Aspherical (IF) (Model B001) that launched in 2008. This new version has numerous improvements and additions said to improve optical performance and is the first lens to feature Tamron’s new High/Low torque modulated Drive (HLD) technology. HLD technology helps improve autofocus performance in terms of speed and smoothness. Further, the lens has an updated exterior design based on Tamron's SP series of lenses. Driving its improved optical performance is a design that includes 16 lens elements in 11 groups. There is one low dispersion (LD) element, one XLD glass element, a molded glass aspherical element and a hybrid aspherical lens. The lens includes broad-band anti-reflection (BBAR) coating as well to help deal with ghosting and flare. To keep your shots sharp at slower shutter speeds, the 10-24mm HLD lens includes 4-stop vibration compensation, a feature absent in its predecessor. The lens includes moisture-resistant construction and fluorine coating on the front element, helping to prevent damage from dust, dirt, moisture and fingerprints. The front of the lens is sized for 77mm screw-in filters. The lens is 3.3 inches (84.6mm) and 3.2 inches (82.1mm) long for Canon and Nikon mounts, respectively, and weighs in at 15.5 ounces (440 grams) for both versions. The lens will be available in the U.S. this spring with a suggested retail price of US$499. For more information on the new Tamron 10-24mm lens, see our preview. Unlike the simultaneously-announced wide-angle zoom lens, Tamron's all-new 70-200mm f/2.8 zoom optic is designed for full-frame cameras in addition to crop-sensor DSLRs. The SP 70-200mm f/2.8 G2 is not a simple rehash of its predecessor but has in fact been redesigned and engineered from the ground up, with a focus on optical, mechanical and electronic designs. In addition to claimed improvements in optical performance, the new lens is said to feature faster autofocus speed and better usability, including teleconverter compatibility. Considering the construction of the lens, the new 70-200mm f/2.8 G2 has a total of 23 elements in 17 groups, including one XLD element and five LD elements. Unsurprisingly, it is not a small lens. The Canon version is 7.6 inches (193.8mm) long and weighs 52.9 ounces (1,500g). The Nikon version is slightly shorter at 7.5 inches (191.3mm) and weighs a bit less than the Canon, tipping the scales at 52.4 ounces (1,485g). The lens features a moisture-proof and dust-resistant construction and fluorine coating. To help with usability, its tripod foot has built-in Arca-Swiss style dovetails, meaning you can easily attach it to many tripods without the need for an extra foot or attachment plate. Improvements to the SP 70-200mm f/2.8 G2 also include a better vibration compensation system, which now has three VC modes for different situations. 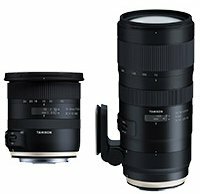 The lens offers up to 5 stops of vibration compensation per Tamron’s specs. Beyond faster autofocus, the new version of the lens also focuses closer than its predecessor by 13.3 inches (33.8cm), offering a maximum reproduction ratio of 1:6.1 without the use of a 1.4x or 2.0x teleconverter. For photographers looking for a 70-200mm f/2.8 zoom lens, a workhorse lens for many, the new Tamron SP 70-200mm f/2.8 G2 lens will be available in March for US$1,299. You can learn more about the new tele-zoom from Tamron in our preview. It will be interesting to see how its performance compares to the much more expensive 70-200mm offerings from Canon and Nikon.